For the last three years I have attempted to talk about Galton and his work in a balanced way. I do this in classes for departments across UCL, including History, Anthroplogy, The Jill Dando Institute for Crime Science, Science and Technology Studies and Information Studies. I do not apologise for Galton. I am fully aware of the effects and implications of his work, and I find his racism disgusting. On the rare occasion that a class comes to the Galton Collection and don’t know that he is the propounder of eugenics, I make sure they know it before they leave. But I don’t think I would be doing my job properly if I didn’t also tell them about how his work in statistics, meteorology and crime science, along with how some of his ideas and inventions have had a huge influence on the way we live today. I try to explain how history is not like a Western; you can’t tell who the bad guy is by the colour hat they are wearing. There is no shortage of hats (up until the 1960s), but they change colour depending on how the scene is lit. 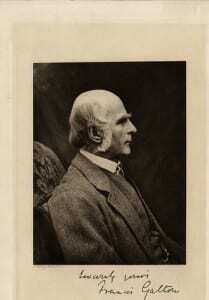 I haven’t written nearly as much as I would have liked to about the Galton Collection in the time I’ve worked with it. Part of the reason for this is that it’s one of two collections I work with and I don’t want to blunder in on such a difficult subject until I’ve been able to research it to an appropriate level. I’m starting to think that another reason is that I don’t think writing a blog entry, an article, a book or a museum label is the same thing as having a meaningful dialogue about a complicated subject. I’ll give you an example. There is one object in the collection that demonstrates how exploring the history of UCL through objects allows us to interrogate our own history and also communicate that history to a wider public. The object is the Haarfarbentafel, which roughly translates as ‘hair colour scale’. Dr. Eugen Fischer’s Haarfarbentafel, or hair colour scale. 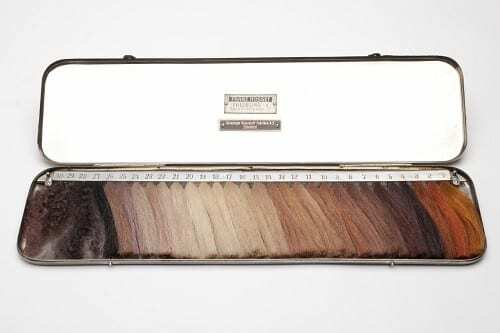 The object is a selection of 30 different colours and textures of synthetic hair in a tin box and, until some Museum Studies students looked into it more deeply, that was pretty much all we knew. Their research uncovered that the hair gauge was designed by the German scientist Dr. Eugen Fischer and used by him to judge the relative ‘whiteness’, according to hair colour and texture, of mixed race people in what is now Namibia. Fischer (whose work went on to inform the antisemitic Nuremberg Laws in Nazi Germany) carried out his work in 1908 and Namibia is the site of the first genocide of the 20th Century, perpetrated by the German ruling forces against the people of the Narma and Herero tribes. Up to three quarters of the population of these people were systematically killed during that time. The students were able to work out that the object probably post-dated Galton (who would have been 83 in 1905 when the instrument was designed) and was probably brought to the university and into the collection by Karl Pearson, founding Professor of the Department of Statistical Science, Galton’s disciple and ardent eugenicist. This approach is already paying dividends. Along with writing an excellent report of their findings which is now part of the documentation for this object (you can hear the whole story from their supervisor, Dr. Carole Reeves, here), the students presented their work at a one day conference at UCL entitled ‘Death By Hair’, which explored how the physical appearance of race was measured to hideous effect not just by skin colour, but also by hair colour and texture. Kandace Chimbiri, one of the speakers at ‘Death by Hair’ reprised her talk for a Black Culture Walks one day event. She asked if I could bring the object to the event to be put on display in the break between talks. Alongside the traditonal questions about authenticity (in my experience, the most common question asked in a museum is: ‘is it real?’), the audience’s main reaction to the object was, understandably, disgust. This was tempered by outrage at what was allowed to happen in the past and what is being done in the present. One woman said, “They never let us look at these things, do they?” The implication being that there is something to hide, that the objects that tell this story are deliberately kept locked behind the doors of the ivory tower. And again, I’m disappointed to say that my instinctive (and thankfully unspoken) response was, “But they are letting you see it; it’s right here in front of you, look I’ve brought it.” It took me longer to work out that while putting one object on public display for 15 minutes was a start, it wasn’t going to instantly make up for centuries of oppression and disenfranchisement, or, perhaps more importantly, a continuing feeling of being ruled out of the game. The objects that make up the Galton Collection provide a vital and unique conduit for inspiring conversations that probably would not happen in their absence. I think they are worth keeping and using, even if the man they relate to is not worth celebrating. They present an opportunity to uncover stories and share them with the wider world, even at a slow trickle. This article — and the ones that will follow — demonstrates my resolve to do this; one object, one class or one story at a time. Subhadra Das is Curator of the UCL Galton and Pathology Collections, and is one of a team working across UCL Teaching & Research Collections.